So A Hard Day’s Night is actually pretty smart. Talk about taking time to gestate. I watched A Hard Day’s Night in a double feature with Spice World back in March sometime. Maybe April. I can’t remember. That’s how long it’s been. I was just thinking the other day that I hadn’t written anything truly half-assed in ages. You’re welcome. In certain respects, A Hard Day’s Night was *exactly* as I’d expected. John, Paul, George and Ringo running amuck while furthering their brand. That’s all you really need to know. Each takes his personality and embellishes as necessary for mass consumption. And so far, we’re on par with Spice World. Really, Spice World takes this formula of self-promotion to a further level because they never intended us to know them. They wanted us to know the brand. The Beatles wanted us to have a glimmer of personal insight. They didn’t need a hype machine to perpetuate their success. Now, with that said, what I’m about to say might shock you. It might even HORRIFY you. Put down any sharp instruments and read this from a distance. I don’t want you facepalming with your computer screen. I still enjoy Spice World more than A Hard Day’s Night. Now hang on a minute. I have a few half-baked thoughts about why that is. First, pop a pill and then we’ll continue. John, Paul, George and Ringo (henceforth known as JPGR) use this opportunity to make something subversively smart. They created the blueprint for a kind of teen movie that eventually gave rise to a legion of godforsaken idol-worship movies like that Bieber monstrosity. Let’s get to know and love these musician folks off stage where they can be plucky, quirky and funny, but scripted too. Don’t forget the scripted part. JPGR, however, use that scripted element not to placate the hordes, but to challenge their notion of JPGR, to hint that maybe, just maybe, they’re human and a little bit above all this hysteria. This, ladies and gents, is an incredibly sly subversion of the band/audience dichotomy. I feel like the Beatles created this rambling one-night travelogue of a movie to then sat back and watched their fans react. Their fans then devoured every second of their film without ever stopping to consider that the band was actually kinda-sorta mocking them. Just a little bit. How much control must they have felt over the medium compared to the relative anarchy of live television or a live performance. At that moment they were the most visible musicians in the world. And instead of basking in their own image, they subvert, challenge and slyly make fun of their audience. RIGHT TO THEIR FACE. Now maybe I’m reading too much into their intentions for making A Hard Day’s Night. I’ve been known to do so. I’m also focusing on one infinitesimal piece of the movie, but this, to me, is easily the most interesting talking point. The running gag with Paul’s grandfather never gets old. Spice World, on the other hand, challenged the genre that A Hard Day’s Night had begotten in 1964. The Spice Girls had no intention of challenging their meticulously (lol) crafted archetypes. They created a movie to build on their brand through animating their characters on screen more fully. Spice World is mostly a vanity project. But Spice World is also a fully-formed satire of the genre. 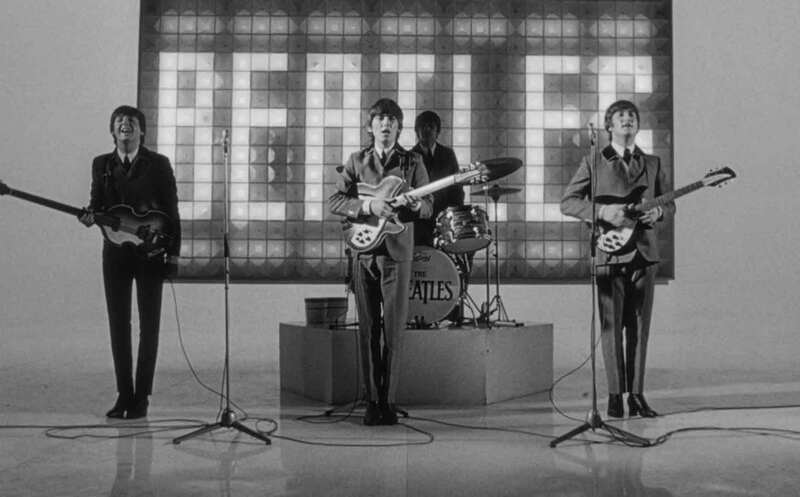 By attempting to do nothing special with the genre elements other than regurgitate A Hard Day’s Night through the lens of the late 1990’s, the creators (director Bob Spiers and writer Kim Fuller) created (perhaps inadvertently) their own brand of commentary on Beatle-mania and fanaticism. A Hard Day’s Night, however, had been created on the Beatles’ upswing. They clearly had a lot more talent and a lot more to offer as their individual careers unfolded. Comparing the two offers fascinating perspectives on popular culture during those two periods of time. How we revere pop stars. How we create them. And how we now dispose of them with ever increasing swiftness due to mass media and the proliferation of information. Here’s the Spice World trailer, you know, just because.